I am a coffee addict. I may only have one mocha a day but I can barely survive without it. It is my treat to myself and represents a little bit of luxury. Last week I wrote how I was looking forward to some me-time this week to exfoliate prior to epilation. 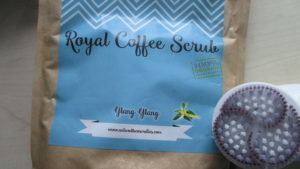 I was thrilled to be sent Naturelle’s Royal Coffee Scrub Ylang Ylang to try out. That’s right. 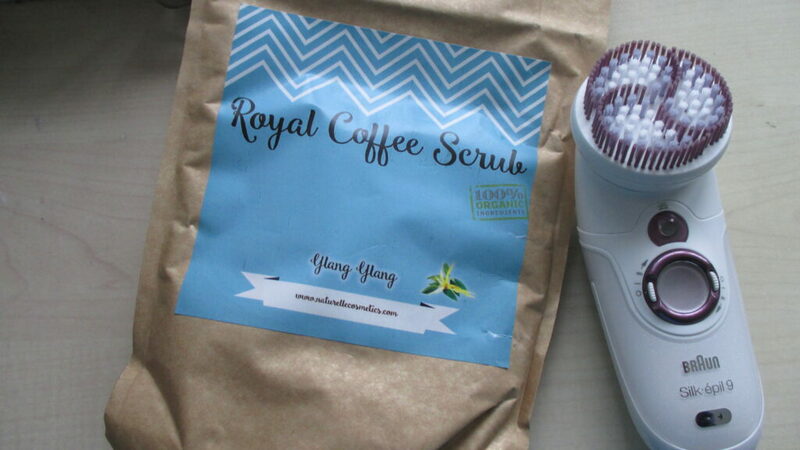 An exfoliating scrub made with two types of coffee! This version has the added bonus of including ylang ylang in the ingredients. This has a relaxing effect and can be used to relieve stress. This product comes in a really subtle golden packet and is surprisingly heavy. I was unsure how much to use so estimated that it would be about a tablespoon for my legs. I don’t know what I was expecting but it did look and smell just like coffee grounds (or soil), very natural and the fragrance was simply divine. It was bizarre. Most of the powder ended up in the bath giving the impression that I was sitting in a bath of coffee. The smell was great 🙂 The mess was quickly washed away and left no stains on the bath or the exfoliating brush. This product will keep going for ages so represents excellent value for money at only £9.95 per pack. Personally, I would have preferred a gel or paste to keep it adhered to my skin while exfoliating with the brush. With a glove, it was much more precise so that is how I will apply it in future. The packet is resealable which is a brilliant idea. 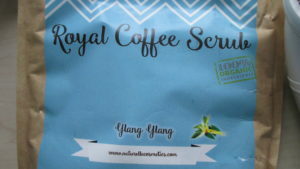 My skin felt a lot fresher after exfoliating with the coffee scrub and I really can’t wait to use it again soon. I have promised myself that I will try to make time for myself once a week and a scrub is a perfect way to relax and improve your body. 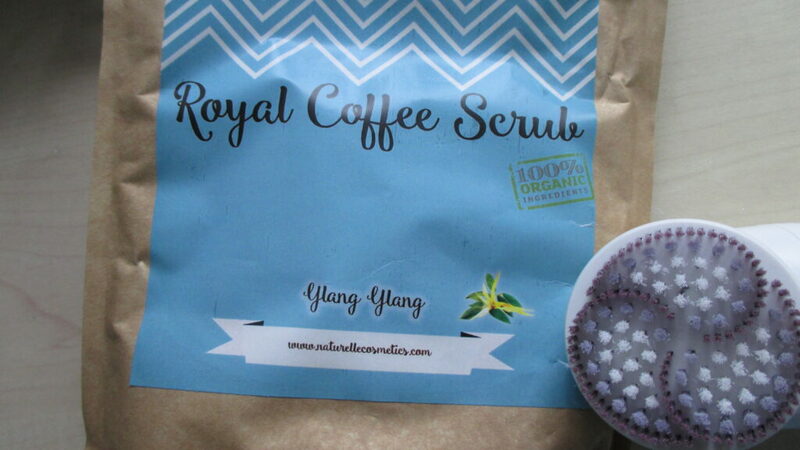 The coffee scrub also comes in a variety of other flavours such as chocolate orange and cinnamon vanilla which sound amazing! This product was sent to me for the purpose of this review, All opinions are honest and entirely my own. Hi Laura, there is nothing like a little self-pampering time to make us feel great. I bet the smell of that scrub was wonderfully stimulating! The chocolate orange scent sounds too good to rub on legs! 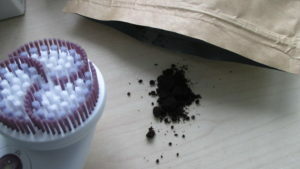 Could you maybe mix the scrub with a little olive or coconut oil to help it adhere to your legs when using the brush? This looks like a scrub I would love to try. 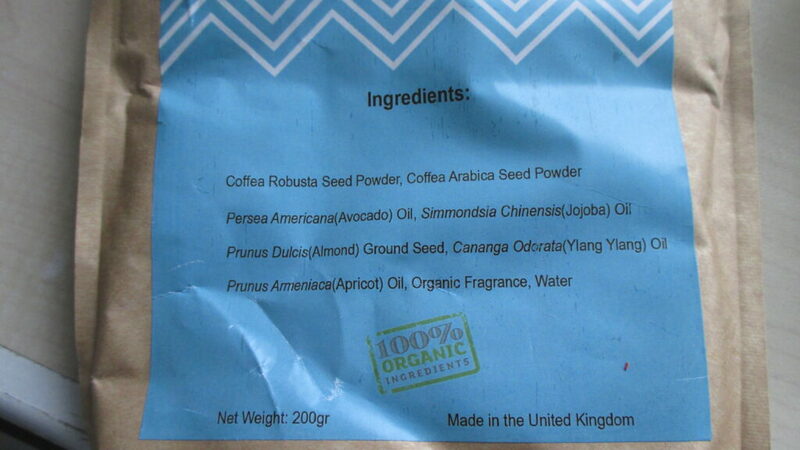 Coffee is super for exfoliating, or so I have heard. This thing wit legs looks like a great idea! 🙂 I hope it works for longer term. 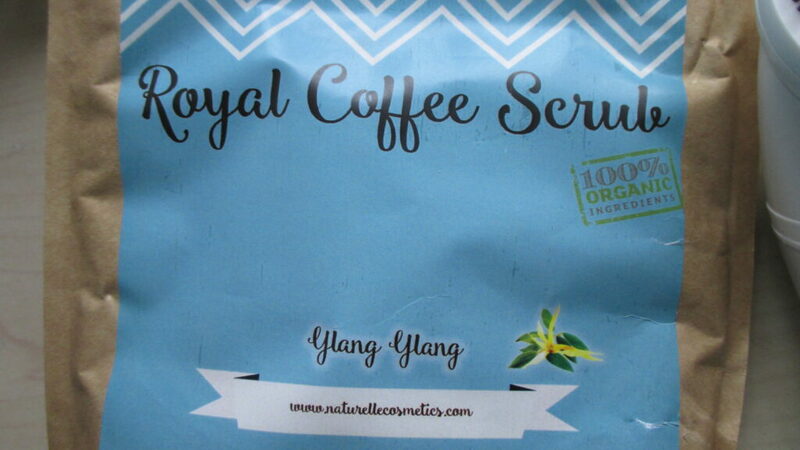 I have been meaning to try a coffee scrub. I heaar they work wonders! I’m a total coffee addict too although I have way more than one cup 🙂 I also use scrubs a lot, they work really well to keep my skin soft. This one sounds lovely, especially with the ylang ylang. I would definitely try it. Good to know it was not so messy. I will look out for the brand. I would love this as I’m not able to drink coffee any more, but I did love it! I think we all need some much needed pamper time. I’ve not heard of this brand before, so I’ll be sure to keep a look out for it! I bet it smells amazing and does sound fantastic value for money. Thank you for sharing your review with #KCACOLS we hope you join us next time too! love coffee, love exfoliator, love this post. and at a great price too! I did read though, that coffee can eliminate hair growth? (Not that id be complaining about that on my legs!!!) not sure if this is true or would apply to this product?